Cobblers boss Chris Wilder believes a key factor in his team’s recent away day successes against Plymouth Argyle and Oxford United is that his team ‘got under the skin’ of their promotion rivals. And he fully expects Gareth Ainsworth and his Wycombe Wanderers team to try and do exactly the same to Town when the two sides meet at Sixfields on Saturday, believing ‘it is all part of the game’. It’s fair to say the reactions of both the Plymouth and Oxford camps following their respective 2-1 and 1-0 home defeats to the Cobblers recently were on the bitter side, with little or no credit being given to Wilder or his Northampton players, who have now won eight league games in a row. The Cobblers boss believes pressure plays a huge part in such post-match reactions from the likes of Derek Adams and Michael Appleton, but that it is the duty of all managers to give the opposition credit when it is due, as Leyton Orient’s Kevin Nolan did after his side were beaten 4-0 by the Cobblers at Brisbane Road last weekend. Other managers have been complimentary to Town in defeat as well, but Oxford boss Appleton focused his anger on referee Keith Hill following the midweek match at the Kassam, feeling the whistler had cost his side at least a point with the penalty award for the only goal, and other decisions he felt favoured Northampton. The home side were incensed Danny Rose wasn’t red-carded for a high tackle on Richard Lundstrom, but Wilder felt the challenge was only worthy of the yellow his player received, and he suggested he too could have picked fault with some of Hill’s decisions, including only giving a yellow to Danny Hylton for his elbow on Zander Diamond. But Wilder feels the referee got things right overall, and said: “We are a competitive side, and it’s maybe the same as what happened at Plymouth where we got under their skin a little bit. 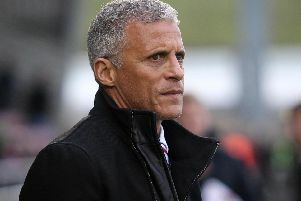 “I think we got under the skin of Oxford United on Tuesday night. “Against Plymouth we rattled them a little bit, and I think we rattled Oxford on Tuesday, and that is part of the game. “It is physical game, it’s a tactical game, it’s a technical game and it is a mental game, and we have shown good signs and qualities in all of those departments right the way through the season. And on the subject of giving credit where it is due, Wilder went on: “Wycombe went to Plymouth the other week and scored early on, and then the oppposition couldn’t break them down, and that is credit to Gareth and his team. “This frustrates me at times, because you look at Paul Cook at Portsmouth and I have loads of time for him. “You look at managers’ interviews, and we have all been in it a long time. “So we look at our team, and say did we play well? We look at the opposition, we look at refereeing decisions and we do talk about it if there has been a ridiculous decision gone against you. “But we look in an honest way, with no spin, and Paul Cook, every time he is on the end of a defeat he looks at his own team and says what they have done right, and what they have done wrong. “He is under a lot of pressure because it is Portsmouth, it’s a great club, but when he talks after a game he always says ‘you have to give the opposition credit here’, he’s not spinning that, and Gareth deserves credit for going to Plymouth, who are second in the league, and getting a result. “We feel we do that and we give credit. “We have dodged a couple of bullets, we dodged a bullet against Accrington, we dodged a bullet against Northwich in the FA Cup, and I came out and said ‘ we didn’t deserve to win’. “But that is football, and sometimes you don’t get what you deserve at times. “There are going to be times over the next 16 games where we will play really well and not get the right result, and you have to just move on. There has been plenty of spice in the recent meetings between the Cobblers and Wycombe, with goals galore and more than a sprinkling of red and yellow cards as well. Wycombe are renowned for pushing the boundaries with what might be termed gamesmanship, but Wilder says it is down to the referee to keep control and that is probably the reason why matches between the teams in recent seasons have regularly seen nine, 10 or 11 minutes of time added on. Wilder admitted: “The games have been quite long! “It will be fun to see who comes out of the tunnel first as that is usually a bit of a battle as well. They try and wait for us, and we waited for them earlier in the season. “But I have nothing but praise for Gareth (Ainsworth), he plays the game, we all play the game, and that is part of it as it is a psychological game at times as well. “You push, you push, you push, and there is somebody in the middle that has to officiate it, that has to officiate for the supporters as well, because they are the paying public and have a say.